Tagged under Production I.G, Light Novel, Series. 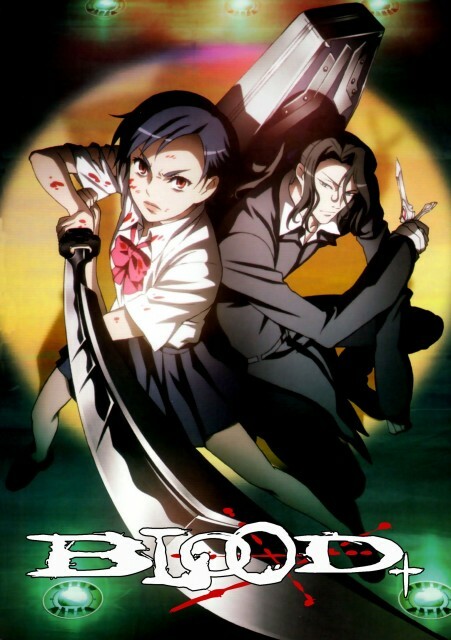 Saya Otonashi is an ordinary high school student, but that soon changes when a chiropteran, a bat-like animal created by the main antagonist, Diva, attacks Saya. Saya then reunites with her chevalier, Hagi, and begins to fight again. Though she can fight again, she must recover her memories. Now she goes out on her journey, along with the Red Shield (an organization that is working alongside Saya), her family, and Hagi to recover her memories, and kill her sister (Diva) to rid the world of the chiropterans. This is my sixth review, after recently finishing it up while I found it online, I have a feeling I probably won't be bothering with buying this one. Sure I liked it, but after watching it again, I felt it was slightly boring in places. It was lacking things, the time jumps and time travels of past moments to present was confusing a few times for me. I do have to admit the angle of chiropteran and chevalier was most unique, it was fresh and new for it's time, but I felt the anime was possibly nearly too long, there were episodes that helped the plot along too much and a few fillers that could have been erased because it wasn't really all that important to the plot. The pace of the story is reaaaaally slow and so it bored halfway through it. The characters and the story are not so bad, but after 7 episodes of nothing really happening, it gets so hard to keep watching. Blood+ had an interesting plot that really lost a lot of steam about mid way through. Things started becoming more predictable and the characters I felt had less growth as the series progressed. It all just dragged on a little too long though. With 50 episodes, I think being closer to about 36 would of been much more fitting for the series. This is one cool anime, though the starting is a lil' boring. As the plot develops it really gets interesting and the ending is kinda sad. Haji is one cool character with his poker face and his unwavering loyalty to Saya. I really like the power of Saya and Diva to make shivalays from dead people that's a really creative idea on the part of the mangaka. Well, the art and character design of this one are good but the storyline it's nothing new and the pace is rather slow. The fights really lack action and sometimes are anti-climatic. The heroine is another problem, she gets on my nerves. That "I'm scared because I don't know what's happening so instead of doing something about it I'll just whine" kind of attitude is really irritating. Maybe she'll change as the series progresses but I don't think I'll finish this anime. It was a pretty good vampire anime, also with a decent number of episodes in my opinion. Saya kind of annoyed me in the first half of the show because of how in denial she was about what she was, and how resistant she was in accepting how such was in the past and in the present. Granted at first it makes sense to be the way, because you don't really understand what's going on, but if you want to protect those close to you so that they don't end up hurt, dead, or turn into new Chiropterans, the exact things you're fighting against, you kinda have to accept it and do your all you can to make sure that the worse doesn't happen. I liked the clothes Saya had after she left on her own with Hagi for a year. I also very much preferred her attitude after she returned from her year away from everyone because even though she was cold, she was also way more focused on what had to be done. I also liked Hagi, the mostly quiet and very devoted protector. His wings looked very cool, it was just a pity that he only used them at the end of the series. I also wonder what will be done if anything about the series as far as a sequel is concerned since Saya's remaining family has the twins, the new queens of the Chiropterans. At the same time, the show was slow paced at certain points. There are no words for how hard Blood+ rocks. It's a different take on the vampire theme without being retarded like Twilight. It's actually really well-thought out and the characters pretty damn cool. They grow and evolve right before your eyes, and their reactions are (considering the circumstances) pretty realistic. Definitely worth watching, and definitely worth a rating of 10. Blood+ is a good vampire anime, different and enjoyable, and I did love its plot enough to watch the entire series through to the end. The end made me cry; I believe it was the best part of the whole freakin' anime. I do believe it was produced very well, and I probably would enjoy watching it again. ^.^ I love Hagi and Solomon! <3 *fan-girl squeal* Very cool anime. B+! I was looking forward to watch this series when I read the anime review in magazine. So few years later, I finally get to see it and Takahashi Hitomi's Aozora no Namida song as the op song caught my interest. I thought the first episode was good and I was hoping to see more awesomeness in the upcoming episode. But it's a bit disappointing in the 'intro' arc, where Saya is still in a period where she's trying to remember everything in her past, she's acted like a weakling even thou she's powerful, she refused to accept her true self and ended up giving problem to everyone around her. But in the later episode after Diva attacked the Red Shield, things got really interesting for me, Saya looks strong and resolved, like a perfect warrior and every characters in the series undergone big changes and matured, esp. Kai. working on owning it next. I was quite impressed to realize that I would enjoy such a long series all the way through and not skipping anything. yes, believe it or not 50 episodes feels long to me. but I adored Saya and felt a kindred to her, Hagi :D well the voice. so many anime that cartoon network have shown us, don't see why people hate them so. Too bad Saya in Blood+ didn't looks strong like Saya in the 'Blood;Last Vampire'. The only irritating part is how weak Saya is in the earlier chapters and the characters took a long time to develop. I love the artwork, the character development, and the ending was perfect! This series has one of the best OSTs-- it was written by Mark Mancina and produced by Hans Zimmer, one of my all time favorite composers. The manga on the other hand, not so much a fan of.